Adelaide Band 108 have entertained audiences in South Australia, Australia and internationally for over fourteen successful years. Adelaide Band 108 have provided quality entertainment in private corporate and public venues for a wide variety of very satisfied clients. Band members are professional music teachers and experts in their fields of audio and recording so we know all about getting the perfect sound for your event with exceptional band equipment and quality dance lighting to help set the mood. 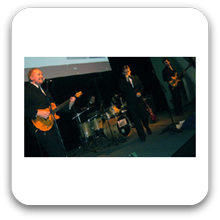 Adelaide Band 108 is a four piece band with great vocals and harmonies, playing hits from the 60s to the present and we tailor our extensive repertoire to suit the client age group or event type, be it elite corporate parties, weddings or public venues. We play at the volume you want and perform every song with energy to entertain you and your guests. For a great live entertainment experience book Adelaide Band 108. Can perform as a: 3, 4 Piece Band and are available to perform in Adelaide and Surrounding Areas.